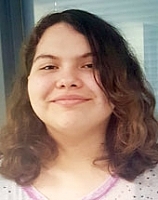 Cynthia is a creative, inquisitive teen who enjoys reading vampire novels and exploring new things of American Indian heritage. She can be a bit shy at first but when she has the opportunity to build trust she will become more outgoing and talkative. Cynthia performs better in small group settings to include community activities and the school setting. She needs a family that is patient, supportive, and committed. Cynthia enjoys cooking, cosmetology, journaling, and drawing. She is very proud of her American Indian heritage and would welcome the opportunity to be more engaged in cultural practices and rituals with a family that shares a similar culture. Cynthia continues to maintain a relationship with some of her extended family members and would like to be able to maintain these relationships. Can you be that supportive and loving family for Cynthia?